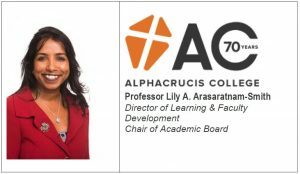 At the last Avondale Women’s Network meeting, we were joined by guest speaker Professor Lily Arasaratnam-Smith from Alphacrucis College located in Parramatta, NSW. Her primary area of expertise is intercultural communication, particularly inte rcultural competence and intercultural contact-seeking behaviour. Her first book, Perception and Communication in Intercultural Spaces(University Press of America, 2011), presents “intercultural spaces” as a new framework with which to understand intercultural communication in today’s culturally diverse communities. Her recent work is on intercultural competence in higher education. Lily is a Fellow of the International Academy for Intercultural Research. The winner of the 2018 Excellence in Teaching award, Lily teaches in the areas of intercultural communication and research methodology. Lily shared her experiences in her journey to becoming an academic with a group of 20 academic and professional female staff at Avondale College. Lily told her stories from her humble upbringing to the current challenges she faces in her role as Director of Learning and Faculty Development, as well as being the Chair of the Academic Board. Lily was inspiring, insightful and most importantly honest about the opportunities and challenges faced by women in higher education. This entry was posted on Thursday, August 9, 2018 at 5:05 pm	and is filed under ABS News, Employees, Leadership. You can follow any responses to this entry through the RSS 2.0 feed. Both comments and pings are currently closed.